The original Spanish text by Borges. In honour of the election campaign and also party leaders resigning, here's the essay I wrote for Overland at the end of last year when John Key left office. But I also have a new piece at the Pantograph Punch about the role of the media in taking down Metiria Turei. If you're only going to read one of them, read that one. "Pape Satàn, pape Satàn aleppe!" If these words ever meant anything in any language, or were otherwise intelligible to the contemporaries of Dante Alighieri, that meaning is lost. What’s left to us is the beginning of a curse, or a demonic incantation, which is quickly cut short by Dante’s guide, Virgil. Taci, maladetto lupo! consuma dentro te con la tua rabbia. But who is this ‘accursed wolf’ whom Virgil hopes will be ‘consumed inwardly by its own rage’? The illustration by Gustavo Dorè looks nothing like a wolf, nor like the fiera crudele – ‘cruel wild beast’ – of the only other line that mentions its appearance. Dorè’s Plutus is a demon with human semblance. Perhaps he’s Plutus or Ploutos, the Greek and Roman god of wealth and agricultural bounty, son of Iaison and Demetra; or else he’s Pluto, the god of the underworld that bears his earlier moniker (Hades), and from which we get the sometimes planet by the same name. Or possibly both, because in medieval times the two were routinely mixed up. Wealth and death, whether married by poetry or by historical accident, oversee the seventh canto of the Inferno. Or, more precisely, the fourth circle of Hell, because for the first time Dante breaks the symmetry of one circle per canto. The fourth and fifth are both here. 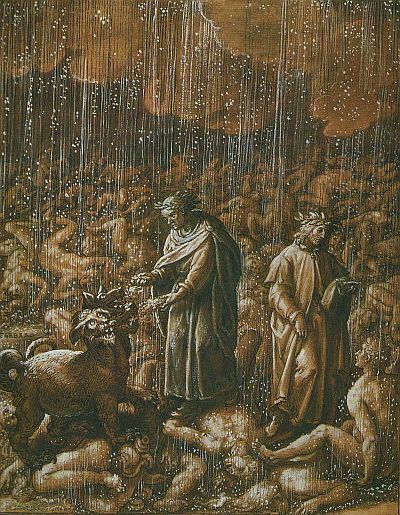 First he and Virgil encounter, on a giant ridge that encircles the whole perimeter of hell as it continues to narrow towards the bottom, the throng of the greedy and the prodigal. The poet calls them gente più ch’altrove troppa, people who, more than elsewhere, are too numerous. But too numerous for what? In excess of what? 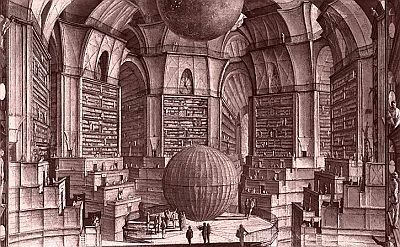 This claim would appear to break a rule of Hell alluded to in the fifth canto, whereby each circle is smaller than the one that precedes it, and is occupied by a smaller number of souls guilty of a greater crime. This violation, then, is likely a result of the poet’s own psychological judgment rather than an actual fact. There shouldn’t be so many people here, so many spirits damned by a sin so grave. And what do they do? What is their contrappasso? The greedy and the squanderers are two faces of the same coin (as it were), and serve two halves of the same punishment. Each is condemned to push a boulder with their chests along the arc of the ridge. When they reach the end of the half circle, they crash into the other group, who are pushing boulders in the opposite direction. As if in a fit of road rage, they exclaim to one another perché tieni? perché burli? ‘Why do you keep?’ ‘Why do you squander thus?’ Then they turn around and start pushing their boulders in the opposite direction, along another semi-circle. And so forth. The most famous illustration is, of course, Dorè’s. 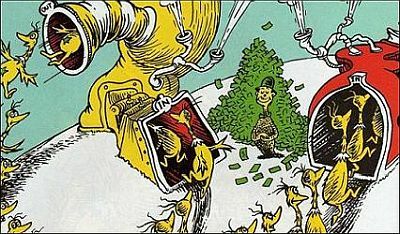 But I am also reminded of the perpetual circle of Dr Seuss’ Star-on, Star-off machines in The Sneetches, overseen by the greedy Sylvester McMonkey McBean. The greedy are greedy, the meaning is pretty much unchanged. But the squanderers are marked by greed as well. Perhaps they collectively represent the mercantile/banking class that was flourishing in Florence in Dante’s lifetime, along with early forms of conspicuous consumption not by aristocrats or priests, as was customary, but regular citizens. We are at the dawn of capitalism, and medieval Florence is one of its nerve centres, servicing as it does the Papal state with a range of financial services (lending, changing, insurance) as well as with increasingly sophisticated goods. Dante has no regard for this private enterprise and its attendant private fortunes. This deeply Christian man, this medieval man, has no ideological basis from which to regard capitalist wealth creation as a means of social or material progress. Therefore he simply sees no future in it, other than the very bleak metaphysical outcome of an eternity spent pushing boulders in Hell. 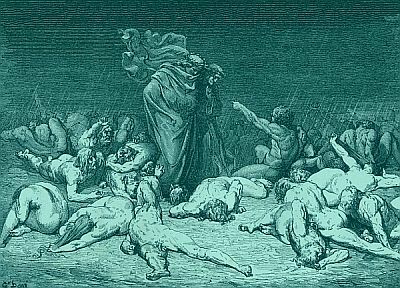 There is another circle in this canto, hosting two quite separate groups of souls, known to the chronicles as the wrathful and the sullen (for Dante rarely names the sinners or the sins using the short-hand of his commentators). Both live in the murky waters of the Styx, the mythological river which is reduced here to a shallow marsh. But the two groups are quite alien to each other. The wrathful stand outside the water, fighting incessantly and for no reason; the sullen – which we might call the clinically depressed, for whom Dante and his time had no compassion – dwell underneath the surface, weighed down by their inwardly directed anger. Their sin consists in part in a failure to act (linking them with the indifferent of Hell’s vestibule) and partly in failing to appreciate the glory of creation and the gift of life, representing the contrary vice to the hedonism of the greedy. They want to talk, lamenting how they roamed sadly ne l'aere dolce che dal sol s'allegra, in the ‘sweet air which by the sun is gladdened’ (per Longfellow), but water pushes the words back down their throats. Enough. In this heroic poem without danger of adversaries, Dante and Virgil have come to the foot of a tower, whereby the canto ends. Previously: Inferno I, II, III, IV, V, VI. We must learn to understand the laws of punishment. The Dantean contrappasso is usually translated as talion, but it doesn’t mean ‘an eye for an eye’: it means to suffer the opposite. We saw an example in Hell’s vestibule, where the throngs of the indifferent – those who spent their lives refusing to take sides – are condemned to chase a tattered flag of indiscernible design. That is to say, to subscribe to and be eternally consumed by a meaningless cause. So now, having come to the third circle – the circle of the gluttons – we may expect the punishment to come in the form of the withdrawal or denial of scrumptious foods that are kept just outside of reach, or for the dwellers to be consumed by a persistent and self-perpetuating hunger. But the sentence is far crueller, and requires a little explanation. As soon as we get past Cerberus, that is. In adapting his ancient sources (above all Virgil) and transferring the demons of Hades to the Christian Hell, Dante always degrades them. Stripped of their nobility and majesty, the likes of Charon and Minos are reduced to infernal interns, servants of a master whose design they cannot comprehend. 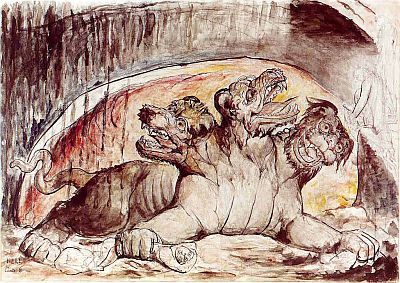 The fearsome three-headed Cerberus of Greek and Latin mythology suffers a similar treatment, while at the same time being rendered a great deal more disquieting by the addition of human features. He has nails, not claws. Hands, not paws. Human faces, not canine muzzles, and bearded too. And belly large, and armed with claws his hands. The monster graffia li spirti ed iscoia ed isquatra – claws at the damned, flays them and tears them apart. But the rain is a greater torment. The rain that makes them howl like dogs. The rain that lashes them incessantly, causing them to writhe and turn in order to expose one side to the unendurable pain and briefly shield the other. I say rain, but it’s more of a thick, putrid hail. 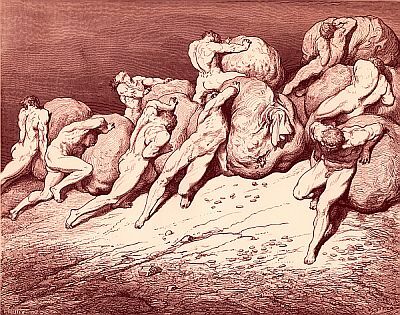 In an image straight out of a modern horror, the mass of the gluttons lies underneath it in a pool of foetid mud, face upwards, like a carpet of bodies, and it’s with horror that Dante describes walking on those shapes that look like persons. A human mud. And all this, for the sin of gluttony? But surely in the Middle Ages the word meant something else, something other. Not a mere carnal indulgence, nor the affectation of being a foodie. 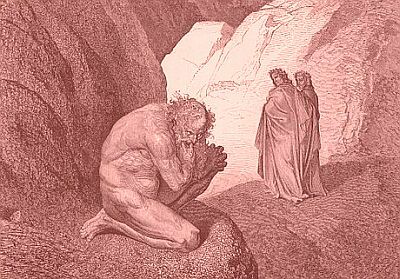 Not a sweet tooth, or an insatiable appetite, or a hyper-refined taste, but a particular form of greed that becomes truly sinful when set against the experience that so many of Dante’s contemporaries could draw upon in order to imagine the torments of Hell: hunger. This is why gluttony is not just sin but a mortal one. In these, the centuries of the Zannis, when a bad crop could decimate entire families, the spectre of hunger, as well as its relentless persistence wherever and whenever it took hold, to not only live comfortably but to hoard food (we’ll meet the otherwise greedy in the next circle) is a crime against human dignity. And so the contrappasso is one of the most humiliating punishments in the whole of Hell. It is here, among the gluttons, that the poets meets Ciacco: a wealthy man of Florence who died after Dante’s birth, and with whom Dante has a conversation about the immediate future of the city. Thus medieval Florence is transported into Hell, its social life superimposed onto that slimy tangle of bodies: the first in a series of irruptions of politics and Dante’s present in the poem. There are more interesting ones, so I’m not going to delve into the details of Ciacco’s prophecy. Suffice to say that his presence here serves also to link the city with the sin. After the conversation, Ciacco lowers his head. Virgil explains that he won’t raise it again until the angels’ trumpets herald the arrival of the nemica podestà, the powerful one that is hostile to the damned. 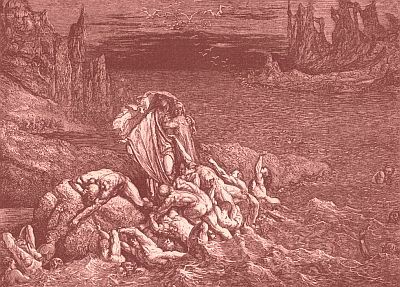 After the day of judgment, when the spirits have been reunited to the bodies of the dead and the final sentences have been pronounced, all of the tortures suffered in Hell will be felt more keenly, so what Dante is effectively witnessing and describing is a mere semblance or preview of the eventual, true and truly eternal Hell. There we found Plutus the great enemy. Previously: Inferno I, II, III, IV, V.